Open the Word, Excel, or PowerPoint file with the text you want to copy. On the File tab, choose Print. The Print window opens. On the Printer drop-down menu, choose Send to OneNote. If you don’t want to copy all the text, enter a page range in the Pages text box. Click the Print button. 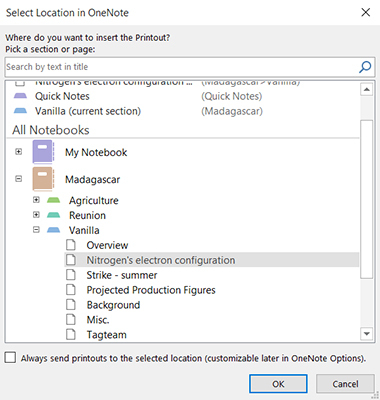 The Select Location in OneNote dialog box opens. Select the page in OneNote where you want to copy the text and click OK.